Partly to mostly cloudy. Low near 55F. Winds WSW at 5 to 10 mph.. Partly to mostly cloudy. Low near 55F. Winds WSW at 5 to 10 mph. Four months after state voters rejected a measure that would have funded repairs to the sinking, underperforming Friant-Kern Canal, state Sen. Melissa Hurtado is building bipartisan support for a $400 million fix. Four months after state voters rejected a measure that would have funded repairs to the sinking, underperforming Friant-Kern Canal, state Sen. Melissa Hurtado is building bipartisan support for a $400 million fix.This portion of the canal is near Coffee Road. Four months after state voters rejected a measure that would have funded repairs to the sinking, underperforming Friant-Kern Canal, state Sen. Melissa Hurtado is building bipartisan support for a $400 million fix. This portion of the canal is near Coffee Road. A 25-mile stretch of land between Terra Bella and Pixley began to sink, and kept sinking, to the point that part of the canal's gravity-powered water flow has slowed to about 1,700 cubic feet per second. The subsidence, caused by over-pumping of groundwater during drought years, means 60 percent less drinking and irrigation water can be delivered to communities along the 152-mile conveyance. A bill introduced this month by state Sen. Melissa Hurtado, D-Sanger, proposes to take $400 million from California's General Fund to fix the canal. Canal users have already contributed about $2 million toward the repair effort, while the federal government has invested about $7.4 million. Also, Rep. Kevin McCarthy, R-Bakersfield, proposed a bill that would free up additional money for canal repairs and other California water infrastructure by redirecting unspent federal money that had been set aside for the California High-Speed Rail Project. Now, without knowing whether Hurtado's bill will pass, the entity that maintains and operates the federally owned canal is looking at three very different options for repairing the structure. Which one ultimately is selected will likely depend on how much money ultimately becomes available for the project. Probably the least expensive option, estimated to cost $150 million to $250 million, would expand the canal's upper portion — the part visible from the surface — from about 60 feet to as much as double that width, but only along the 25-mile problem section. 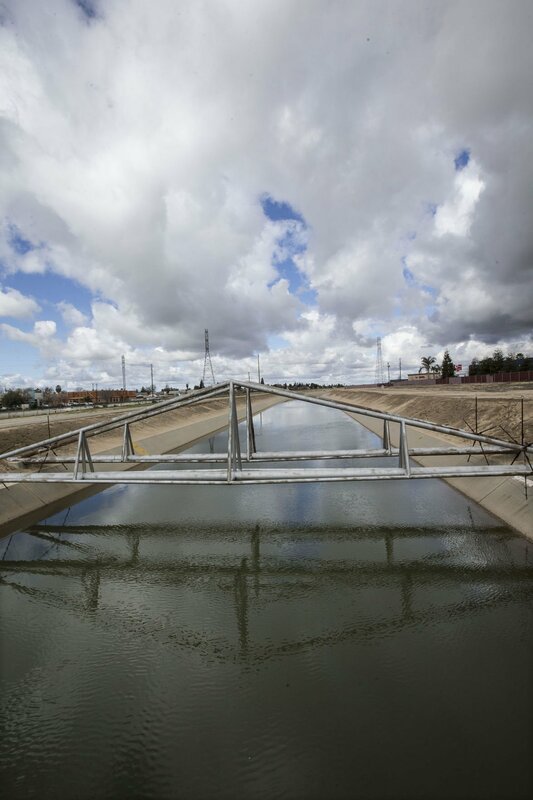 Douglas DeFlitch, chief operating officer at the Friant Water Authority, headquartered in Lindsay, said widening the canal's top would help by increasing conveyance capacity within what is now the structure's fastest-flowing area. "You've got a lot more space to move that water," he said. The third possibility under study by the authority is the one for which no firm price estimates exist. It would replace the canal along the entire 25-mile stretch that has experienced the most subsidence, perhaps using the existing structure's banks. A big drawback of that option is that, unlike the two alternatives, it would require shutting down the canal for an undetermined but "significant" period of time, DeFlitch said. "Those are the pluses and minuses we've got to consider as we move forward as part of this big project," he said. "We're still mixing and matching these options together to see." DeFlitch offered a "ballpark" guess that the repairs could take 2 ½ to 3 years. The water authority's governing board is expected to review the options and rank them next month. Overdrafting of water under the canal is supposed to end once state regulations contained in the Sustainable Groundwater Management Act take effect. But that's not expected to happen until perhaps 2040. Geotechnical modeling paid for by the water authority suggest the ground might continue to sink during the next 20 years. If all goes well, DeFlitch said, the ground won't subside at all during that time. In the worst case, there will be another 4 feet of subsidence, he said. Meanwhile, Hurtado's bill has received bipartisan backing. In addition to support from Democratic Assembly members, SB 559 is co-authored by two Republican state senators, Andreas Borgeas of Fresno and Devon Mathis of Visalia. Hurtado asserted water infrastructure isn't a partisan issue but an economic one that deserves votes from lawmakers across the state. Supplying water to more than a quarter of the valley's agricultural land, the canal is integral to $4 billion per year in farming production, she said. "It's an investment for California because we're talking about a major economic force that, if neglected, can just really make things worse for us as a state and our economy," she said. One reason is that overuse of groundwater has led to creation of the Sustainable Groundwater Management Act, which promises to put new limitations on the practice. That has raised awareness statewide about how dire the valley's water challenges are, Salas said. "If we can create sustainable water infrastructure to help move water around the state," he said, "it's going to benefit every Californian."